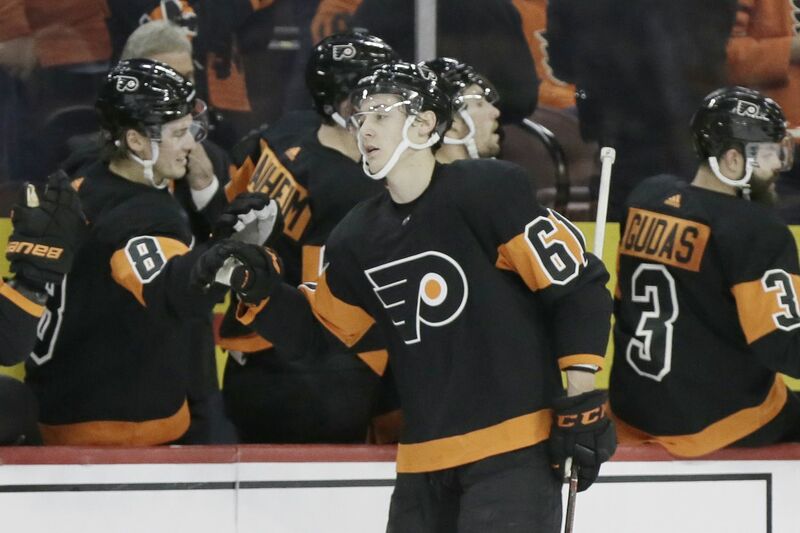 Flyers defenseman Phil Myers is congratulated after a recent goal against Washington. He is questionable for Tuesday's game against visiting Montreal. Defensemen Phil Myers and Samuel Morin are the latest Flyers battling flu-like symptoms, and Myers will be missing from the lineup Tuesday night against visiting Montreal. Morin would have been a healthy scratch even if healthy. Ryan Hartman and Claude Giroux have also battled the flu recently. Myers (two points, plus-3 in 13 games) will be replaced by Andrew MacDonald, who has been in and out of the lineup the last three weeks and has been a healthy scratch in five of the last nine games. Carter Hart will be in the nets Tuesday and will be trying to avenge a 5-1 loss in Montreal on Feb. 21. Hart allowed three goals on nine shots and was removed from that game midway through the opening period. In that game, Hart was the difference as he made 33 saves – including 12 in a Montreal-dominated first period – in a Flyers’ 5-2 victory. Nolan Patrick (two goals), Travis Konecny (goal, assist), and Gostisbehere (two assists) keyed the attack. With 10 games left, the Flyers are six points behind Columbus for the final playoff spot, and the Canadiens are three points behind the Blue Jackets. Columbus plays at Calgary on Tuesday. The 20-year-old Hart (14-9-1, 2.76 GAA, .918 save percentage) will face the goalie he idolized growing up, Carey Price, who made 29 saves in the 5-1 win Feb. 21. Price is 29-22-5 with a 2.57 GAA and .915 save percentage. In his career against the Flyers, Price, 31, is 14-11-1 with a 2.58 GAA and .917 save percentage. Hart has a 1-1 record with a 4.25 GAA and .886 save percentage in two career games against the Habs. In their last seven games, the Flyers are 0 for 17 on the power play. “Obviously, the numbers aren’t where we expected them to be,” Voracek said. “… I think we’re getting off the page too much.” … The Habs have three former Flyers on their roster – Dale Weise, Jordan Weal and Christian Folin. The latter two players will be in the lineup Tuesday, based on the morning skate. ... The Flyers have a 77-81-30-7 lifetime record against Montreal. … Travis Sanheim played a career-high 26:19 in the dramatic 2-1 OT win in Pittsburgh on Sunday. … Gostisbehere has 14 points in 10 career games against Montreal, an average of 1.40 points per contest. … Ivan Provorov needs five points to reach 100 in his career.